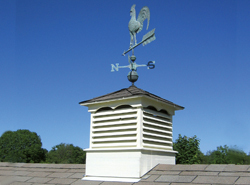 A cupola is a small, often dome-like structure found on top of the roof of a building. They can include an interior lantern for added interest, but they are now mostly decorative and can give a custom feel to the house plan you build. They work well with many different types of architecture, but most often they are seen with Country style,New England and Cape Cod style, Colonial style and Traditional style house designs. Our collection of cuploa plans includes many types and styles perfect fr enahncing your home's curb appeal. We offer detailed drawings that allow to build this additional onto your home quite easily. With a wide variety of plans, we are sure that you will find the perfect do-it-yourself project to fit your home's style perfectly.